https://sheisfiercehq.com/shop/ cheap viagra 100mg worldwide shipping drugstore At the Jan. 22 Allied Gardens Grantville Community Council (AGGCC) Town Hall Meeting, presentations were made by San Diego Police Department Community Service Officer John Steffen, Roarke Stanly from District 7 City Councilmember Scott Sherman’s office, Benjamin Branch librarian Kathryn Johnson, and the Grantville Allied Gardens Kiwanis Club. Our thanks for their service to our community and for the information that is vital to our wellbeing. 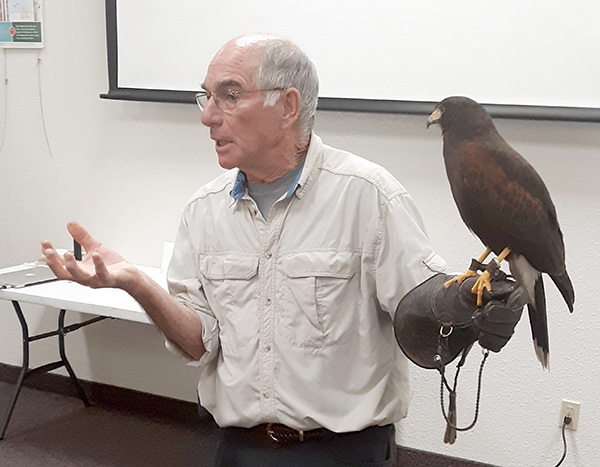 order now Our guest speaker was Dr. Bob Gordon who presented his lecture “Birds of Prey from All Angles.” We were joined by his companion Huxley, a Harris’s Hawk. He discussed the many species of raptors found in our area and the essential role they perform in our local ecology. He reminded us that as robust as these animals may seem to be, our pesticides, our trash, and our destruction of the environment are a great threat to them. buy now The community’s plans to support the homeless veterans who will soon take up residence at Zephyr (located in the old Motel 6 on Alvarado Canyon Road) and at Stella (the new development at Twain and Fairmont) are reaching fruition. We have formed a working group of a dozen or so folks from our churches, the neighborhood, local businesses, PATH, and Affirmed Housing to manage this project. We are particularly blessed with the leadership of Ascension Lutheran Church and Benjamin Branch Library’s Kathryn Johnson. Even now, early in this venture, the community has offered a considerable supply of household goods. The collection of those materials continues and we still need your support by bringing kitchen and bathroom supplies to Benjamin Library. We will keep you advised of our progress in this monthly article, in our newsletter, and on our web site. Our next town hall meeting will be on Tuesday, March 26, at 6:30 p.m. at Benjamin Library (at the corner of Zion and Glenroy). Along with important information from our civic representatives, we will hear from our featured speaker San Diego State University President Adele de la Torre. She will speak to her vision of the role the university plays in our civic health and prosperity. But the primary value of her attendance will be found in our opportunity to find out how the development of the stadium property will affect Grantville and Allied Gardens and to press her for a place for our communities in the planning of this project. The AGGCC board of directors meets on the first Tuesday of each month at 6:30 p.m. at Benjamin Library, at the corner of Zion Avenue and Glenroy Street. The next meeting will be on Tuesday, March 5. Join our board and we will support your passions for the neighborhood. Our communities need you. —Shain Haug is president of the Allied Gardens Grantville Community Council. Reach him at aggccshain@yahoo.com.